It's not just a matter of preference; it's really just ordinary physics and geometry. It’s not just a matter of preference; it’s really just ordinary physics and geometry. Color, as you may have heard, is nothing more than white light broken up by material that makes it bend, or change direction, a phenomenon called refraction. Our atmosphere is full of these tiny refractive particles that break up all of our light into the colors we see. So how does that help you coordinate your socks with your laptop case, you ask? It turns out, all you need is geometry. If you line up all of those sheared-off colors in wavelength order, you get a rainbow. Bend that rainbow around until you make a circle. 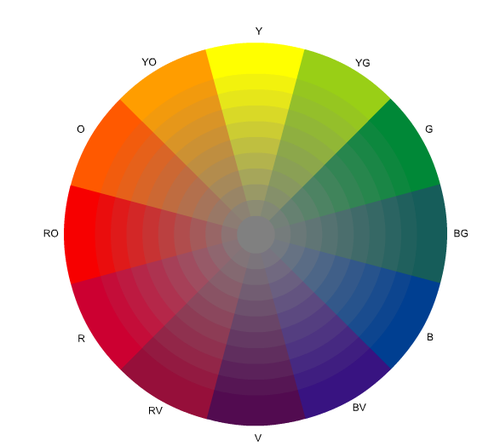 Now you have a color wheel. Take any color wheel and draw a straight line to the other side of the color wheel. You now have a pair of complementary colors. If you were to mix two complementary hues of light, you would end up with a perfectly neutral (colorless) shade of gray. In other words, the wavelengths of these colors precisely cancel each other out. This is the underlying idea behind all color theory. When we see complementary colors side by side at a distance, we read the colors as gray, even though they aren’t grey at all. In larger proportions, complementary colors can activate an image — either attracting or repelling the eye. It all depends on the proportions we use. As a general rule, never use complementary pairs in a 50:50 split. Pick a dominant color from the pair and use the complement to draw the eye to the most important areas in your composition. Are two colors too few for you? Create a triangle on your color wheel for a more complex scheme, or even a square. Even if you’re color blind, you can use simple geometry to make your colors really pop. Got a favorite color scheme? Let us know!